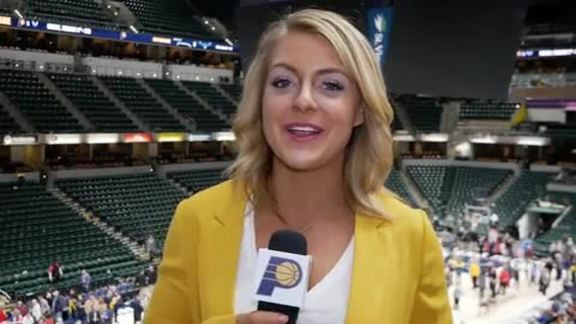 February 9, 2019 - Pacers.com's Katie Hargitt breaks down the Pacers' fifth straight victory, as Indiana delivered yet another impressive defensive performance to lead the Pacers to a 15-point win. February 09, 2019: Cleveland Cavaliers vs. Indiana Pacers - Bojan Bogdanovic finishes off a sweet move for two. 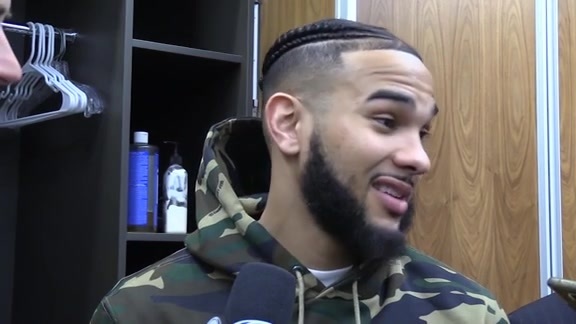 February 9, 2019 - Pacers players Myles Turner, Edmond Sunmer, and Cory Joseph discussed Indiana's 105-90 victory over the Cleveland Cavaliers on Saturday night at Bankers Life Fieldhouse. February 09, 2019: Cleveland Cavaliers vs. Indiana Pacers - Myles Turner picks up his first block of the night after denying Collin Sexton. February 09, 2019: Cleveland Cavaliers vs. Indiana Pacers - Thaddeus Young finds a cutting Bojan Bogdanovic for the easy bucket. February 09, 2019: Cleveland Cavaliers vs. Indiana Pacers - Aaron Holiday drives baseline and finishes the reverse layup. February 09, 2019: Cleveland Cavaliers vs. Indiana Pacers - Myles Turner catches fire for Indiana scoring 10 points in the first four minutes against Cleveland. 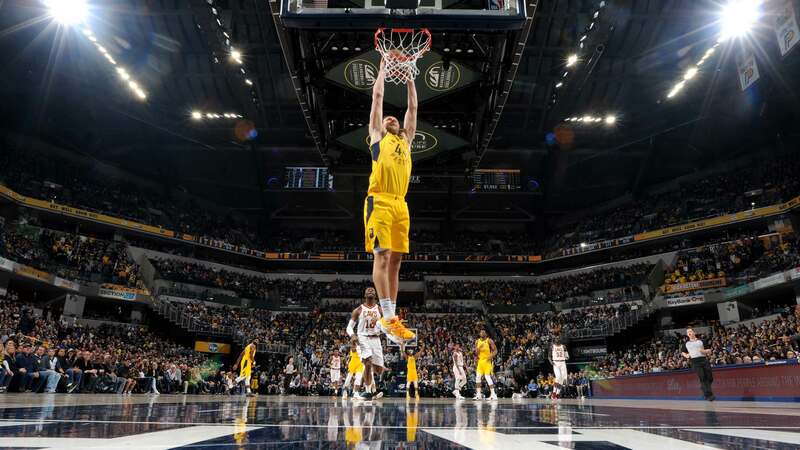 February 09, 2019: Cleveland Cavaliers vs. Indiana Pacers - Bojan Bogdanovic finishes the wide open slam dunk in transition. The Pacers kept their hot streak alive on Saturday night, winning their fifth consecutive game with a 105-90 victory over the visiting Cavaliers on Saturday night. Indiana was able to control the game for nearly the entire night, eventually putting the final touches on the victory when Domantas Sabonis lasered a pass to Bojan Bogdanovic on the wing, who drilled it to put the Pacers up by 21 points with 4:37 remaining in the game. "Wins are hard to come by in this league, there's going to be ups and down. 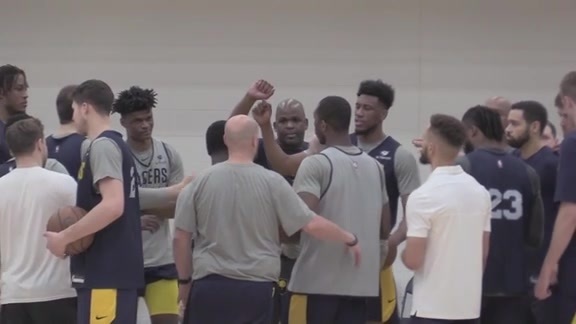 To this point, we had to go through that (four game losing streak)," said Myles Turner, who finished with 14 points, eight rebounds, and three blocks. "I think that stretch was good for us because it kind of brought us down to earth a little bit and at the same time, I think it made us a little bit tougher." Bogdanovic, who connected on three 3-pointers, was the Pacers' leading scorer with 23 points. As a team, the Pacers (37-19) shot the ball well all night, outscoring the Cavs in three of the four quarters and making 53.6 percent of their attempts from the field. Strong performances off the bench by Sabonis (13 points, 10 rebounds) and Cory Joseph (10 points, 10 assists, 9 rebounds), helped deliver punishing blows to a Cavaliers (11-45) team still in flux from Thursday's trade deadline. Joseph, who finished his night one rebound shy of a triple-double, was quick to credit the team's defensive performance, as they held the Cavs to just 90 points and only sent Cleveland to the free throw line for nine attempts. "We're helping each other out. We're giving a better effort on the defensive end, we're rotating quicker," Joseph explained. "Myles is doing a hell of a job in the paint, changing shots and contesting shots, and we're just playing with a lot more energy." The Cavs were led by Jordan Clarkson, who was able to deliver 18 points for Cleveland. In the game's early moments, Myles Turner helped ignite the Pacers' offense, converting on a baseline slam, then following it up with back-to-back 3-pointers. On their next possession, a Pacers steal led to an open court slam from Bogdanovic, forcing the Cavs into their first timeout with Indiana leading 12-5. The Pacers continued to stay dialed in throughout frame, as Indiana grabbed a 30-17 lead by the time the quarter came to an end. To begin the second quarter, Indiana's bench unit picked up where the starters left off as TJ Leaf scored three straight buckets for the Pacers, opening up a 15-point lead on the visiting Cavs. For the remainder of the quarter, the Pacers continued to hold full control over the game, entering the halftime locker room leading 54-42. With the second half underway, the Pacers looked as if they might put the game away early, getting up 62-46 early in the third quarter. But the Cavs had plenty of fight left, as Larry Nance Jr. connected on a pair of threes late in the quarter to get within 12. The Pacers were able to close the quarter strong, however, as Joseph drilled a jump shot to extend Indiana's lead to a 74-60 advantage entering the final quarter at the Fieldhouse. While the Cavs started the fourth quarter with buckets from Clarkson and Marquese Chriss, Indiana quickly responded, as Sabonis hammered home a slam on the fastbreak to push the Pacers' lead back to 16. From there, Indiana continued its scoring barrage, inflating their lead to as much as 21 points as they cruised to the #PacersWin. "I think every game for us is showing growth," said Pacers head coach Nate McMillan. "Playing against a team like Cleveland who hasn't had success and coming off of two good wins, you kind of anticipate a letdown. Tonight was a game showing growth where we didn't have that letdown. Every game now is an opportunity for us to show growth." The Pacers crushed the Cavs on the glass, outrebounding Cleveland 43-30. Indiana racked up 31 assists, improving to 13-2 when dishing out 30 or more assists. The Pacers shot 53.6 from the field on Saturday, improving to 20-1 when shooting 50 percent or better. Both Cory Joseph (10 points, 10 assists) and Domantas Sabonis (13 points, 10 rebounds) recorded double-doubles off the bench for the Pacers. The win was Indiana's 21st home victory of the season, guaranteeing a winning record at home for 2018-19. That marks the Pacers' 30th consecutive season with a winning record at home — the longest active streak in the NBA.